This exclusive Stefano Rome Tours excursion is designed with the adventurous traveler in mind, searching to discover Italy’s well kept secrets off the beaten tourist paths. You will explore two enchanting yet dramatically diverse Renaissance parks that will excite your imagination with the mysteries and beauty unfolding all around you: The Sacred Wood, also popularly known as the Monsters Park, and the elegant Villa Lante. For lunch, you will visit the charming medieval hilltop town of Soriano nel Cimino, where the art of traditional Italian cuisine and locally grown specialties provide an unforgettably culinary delight. Your professional Stefano Rome Tours English speaking Driver will meet you at your hotel at 8:00AM in a comfortable deluxe vehicle and drop you off at approximately 5:30 PM. This tour is not available on Mondays or holidays when either site is closed. A leisurely 90 minute drive through the beautiful Roman countryside and into the region of Tuscia will bring you to the quaint and ancient town of Bomarzo where you will visit the Monsters Park, or “Parco dei Mostri” in Italian. Nested in a dense surreal forest with leafy vegetation with a soft carpet of green moss covering rocks and damp surfaces, giant sculptures of larger-than-life mythological figures and legendary monsters reveal themselves behind each corner. Be prepared to encounter giants, dragons, ogres, monsters and creatures, emerging from the moss covered ground or hewn out of natural rocks within the park. This 16th century mythical garden was commissioned by Pier Francesco Orsini, member of the famous Orsini family and a patron of the arts, and dedicated the garden to the memory to his deceased wife Giulia Farnese. The grieving Duke of Bomarzo created this whimsical garden “only to ease the heart”. The Orsini Castle itself still crowns the town of Bomarzo. Among the most astonishing sculptures and creatures you will encounter in this magical forest is the sea monster, gigantic Orc whose open mouth you can enter into, colossal Hercules fighting Cacus, the fountain of Pegasus, the giant turtle with the goddess Victory standing on its shell, the giant sleeping nymph, winged dragon and the hounds, Hanibal’s towering elephant catching a fallen Roman soldier, tall ninfeo with niches carved into the hill rock, and more mythological deities, creatures, and monsters. One of the most spectacular buildings in this surreal garden is the leaning house. It looks very inviting, but ironically it was intentionally constructed so guests cannot stay long. Visitors walking through the leaning house have claimed strange gravitational sensations that make it difficult to spend too much time inside this inexplicably strange building. Something out of the Twilight Zone, it cannot be described, but best to be experienced. This is a very unique and unusual park that adults and children alike will love and enjoy exploring. Afterward we leave the Monster Park you will visit the quaint but breathtaking ancient hilltop town of Soriano nel Cimino for a stroll through its quiet medieval streets that don’t see many tourists. This quaint sleepy town gives visitors the feel of being an authentic Italian village unspoilt by tourism. This is also the perfect place to stop for a relaxing traditional lunch where local dishes are prepared using fresh local ingredients specific to the region. 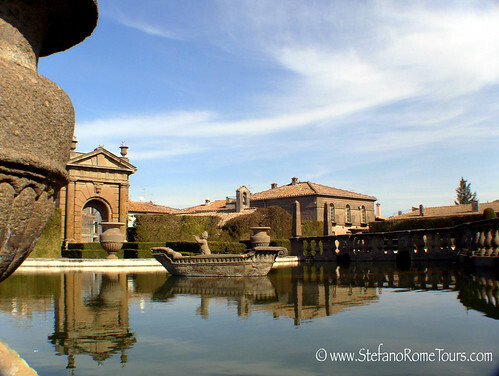 From here a short drive will take you to the elegant 16th century Villa Lante in the town of Bagnaia. Unlike the Monster Park that was created by dukes such as Orsini, Villa Lante in the town of Bagnaia was commissioned by two bishops of Viterbo who succeeded one another: one a man of simple taste, and the second the nephew of Pope Sixtus V who became cardinal at the young age of 17. This quite unusual combination produced one of the most fascinating Italian gardens of the Mannerist period of Italian Renaissance. Villa Lante features two nearly identical villas, one on each side of the gardens, with beautifully frescoed interiors built by different owners 3 decades apart. The architects of the gardens of Villa Lante drew inspirations from some the most spectacular existing gardens: the Belvedere at the Vatican and the harmonious water fountains at Villa d’Este in Tivoli. Perfectly proportioned and symmetrical with special attention to rich details, the formal garden at the base is a perfect square parterre. Carefully manicured and geometrically designed evergreen hedge labyrinths, gravel paths to stroll throughout, and the lavishly embellished Fontana dei Quattro Mori (Fountain of the Four Moors) in the center decorated with large urns, stone pineapples and a variety of sculptures, give this area of the garden a most picturesque appearance of peaceful elegance. The upper terraces of the garden evoke a different mood with lavish curved stone staircases, flowing cascades and hydraulic waterworks, lively fountains, lava stone sculptures of mythical marine gods, and dripping grottoes. Flanking the grottoes at the summit of the gardens are two small buildings, the Houses of the Muses, with textured walls that imitate the rough stone of the grottoes. The impressive Water Chain with water tumultuously flowing downward is considered the earliest and best example of a stepping cascade. A very long stone table with a water basin carved along its center like a crystalline table runner is said to have been where the cardinals entertained their guests for dinners al fresco, and the water basin kept their wine chilled. Trees and lush vegetation offer cool shade on sunny days and make it ideal for strolls as you enjoy the fine details that surprise you at every turn. The evocative Villa Lante is the quintessential Renaissance formal garden that has inspired many like it worldwide since it was created nearly 5 centuries ago. This marks the end of your Monsters and Myths Tour. From here your driver will bring you back to your hotel in Rome. Thank you for choosing Stefano Rome Tours for your Tours and Shore Excursions in Rome and beyond. We look forward to meeting you in Rome! * This tour is not available on Mondays or holidays when either site is closed. * This tour is available only from your Rome accommodation. * The price of the Monsters and Myths Tour includes a private English speaking driver and deluxe vehicle, VAT tax, fuel, and toll applicable fees. * The price of the Monsters and Myths Tour does not include entrance fees, lunch, or gratuities. * Please allow up to 24 hours for email correspondences. 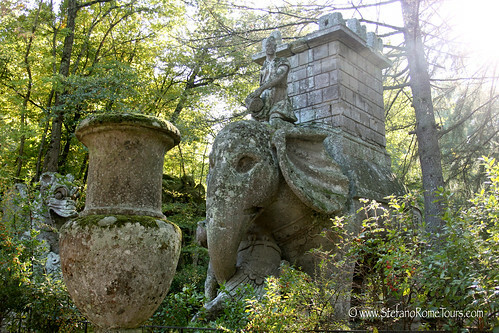 * Entrance tickets to Bomarzo Monster Park is currently 10 Euros per person. Children between ages of 4-13 pay 8 Euros per person. * Entrance tickets to Villa Lante is currently 5 Euros per person. * Please note that entry ticket prices are at the discretion of the sites and may change unexpectedly; therefore prices cannot be guaranteed to stay the same after you book the tour. * This tour provides and English speaking Driver who is not a Licensed Tour Guide. In Italy only locally licensed Tour Guides are permitted to guide guests to sightsee away from the vehicle. In order to be in compliance with Italian laws, drivers are obliged to remain with the vehicle while guests sight see on foot. * Payment for the tour will be made in Euro funds to your Driver at the end of your journey. Pre-Payment for the tour is possible via PayPal. Please inform us if you wish to prepay for your tour using PayPal. * For best weather opportunities, we recommend this tour during the months of April to October, although weather conditions always vary and are never predictable. Weather in late fall and early spring tend to be wetter than usual, and winters quite cold on higher elevations. * In case of inclement weather that make visiting the Monster Park and Villa Lante impossible, we can assist you with substituting this tour with a different one where the weather is either favorable or not effected by weather conditions. You always have the opportunity to substitute tours or cancel at least 7 days in advance. Don’t worry, we do not ask for your personal credit card information, require advance deposits to reserve your tour, or penalize you for cancellations. We operate on the Honor System, so we kindly ask that cancellations be made at the minimum 7 days in advance so we can rebook your service and your reserved driver does not lose work for that day. Cancellations must be made via email and confirmed by us so we have it on record. We do not accept cancellations by phone, text message or 3rd party. We thank you for your cooperation and consideration. * Please wear comfortable shoes as The Monster Park may have some uneven terrain along its natural dirt pathways. 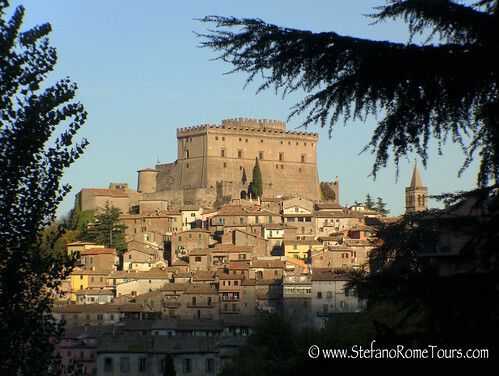 * High elevation hilltop towns and forested parks are cooler in temperature than Rome. Please take that into consideration and bring appropriate attire such as extra sweaters or jackets. * There are many opportunities to take photos and videos, so be sure you have your camera ready!